International customers ordering more than 3, please call for shipping quote. 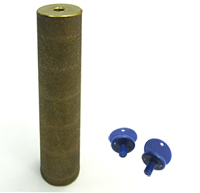 The mineral electrode is sacrificial and designed to slowly disintegrate. After an average of 12 - 24 months, depending on conditions, the electrode will wear away and require replacement. You will know this when it is "pencil thin", or about 1/4 inch at its thinnest point. For more information, download the floatron's Operational Manual.